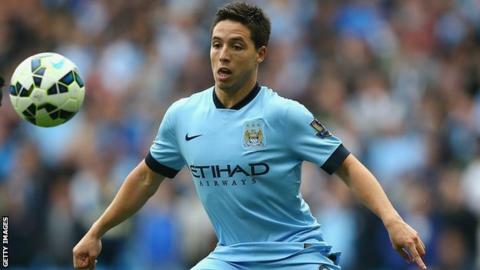 Manchester City midfielder Samir Nasri says players may be replaced if his side fail to qualify for the Champions League knockout stages. City are bottom of Group E, with two points from four matches and could be eliminated if they fail to beat Bayern Munich at Etihad Stadium on Tuesday. "We need to do something or otherwise next year it's going to be new players and new everything," Nasri, 27, said. City have never progressed beyond the last-16 stage of the competition. They could suffer a group-stage exit for a third time in four years if they lose and either CSKA Moscow or Roma win in the other group match. Manager Manuel Pellegrini led the Premier League champions to the knockout stages for the first time last season. "Let's be honest, with the salary of every player and the level of those players, 90% of the team are world class, then not to qualify from the first round of the Champions League would be a huge blow for the club - and for us as well," Nasri told national newspaper reporters. Sheikh Mansour bin Zayed al-Nahyan and the Abu Dhabi ruling family have spent £750m on players alone since their August 2008 takeover. But Bayern midfielder Xabi Alonso says City's European struggles show that financial might does not always bring success. "There is no set formula where you are buying success," Alonso, 32, said. "Football is not mathematics." However, former Liverpool and Real Madrid man Alonso expects City's financial clout to translate to Champions League success eventually. "It's hard to tell from the outside but of course you expect that any season City will make that impact in Europe," he said. "So far they haven't done it but I'm pretty sure that big year for City isn't far away because season by season they try to improve." City have drawn two matches, at home to Roma and away to CSKA, and lost two games in their group, and Argentine defender Martin Demichelis says the players are disappointed with this season's European campaign. "We are not happy with our Champions League performances. We have a good squad and should do much better," he said.